Did you know that olive oil can reduce the risk of many types of cancers? It can make you less likely to develop Type 2 diabetes. It can slow the aging of your heart, lower your bad cholesterol levels, reduce the risk of stroke and of getting Alzheimer’s. Such are the claims made by the Olive Oil Times, (yes, there is such a publication), as well as many, many other sources. 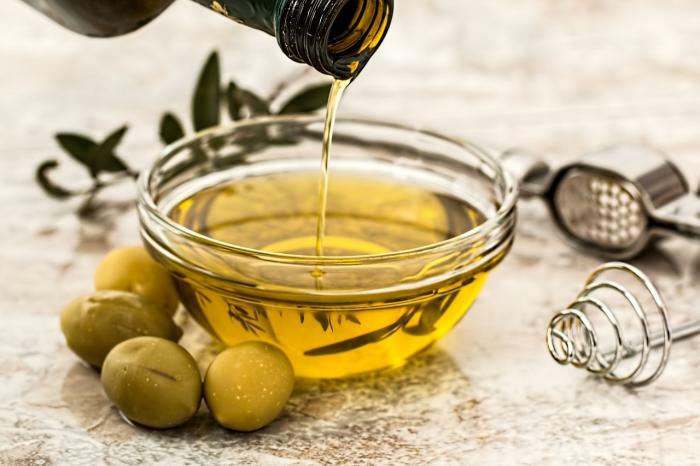 There is a lot of evidence that the monounsaturated fats, antioxidants, and anti-inflammatory properties of olive oil can have a very real and positive effect on your well-being. Olive oil is the cornerstone of the Mediterranean Diet, which is known to be healthy. There are doctors who prescribe a tablespoon or two of olive oil per day to their patients. 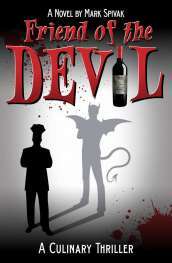 It’s similar to the type of evidence that drinking a glass or two of red wine is beneficial. Simply google “health benefits of olive oil” and your computer will explode just as much as if you google “health benefits of wine”. Balsamic vinegars are no slouch either. The antioxidants and polyphenols in them are said to fight cancer, heart attacks and diabetes. They are natural pain relievers containing chemicals similar anti-inflammatories like the ones you are buying in the drug store. They also suppress your appetite and aid your digestion. In fact, the word balsamic comes from the Latin word balsamum which means restorative or curative. And, if you do a little research, there is no lack of evidence for these claims either. So what? How much of this stuff do you consume in a normal day? How many salads can you eat? The answer is that, particularly if you like to cook, you may be consuming a lot more of these products in the future, and they will be better quality, healthier and tastier than the ones you are eating now. In the words of that well-known food sage Emeril Lagasse, these products have been “kicked up”. 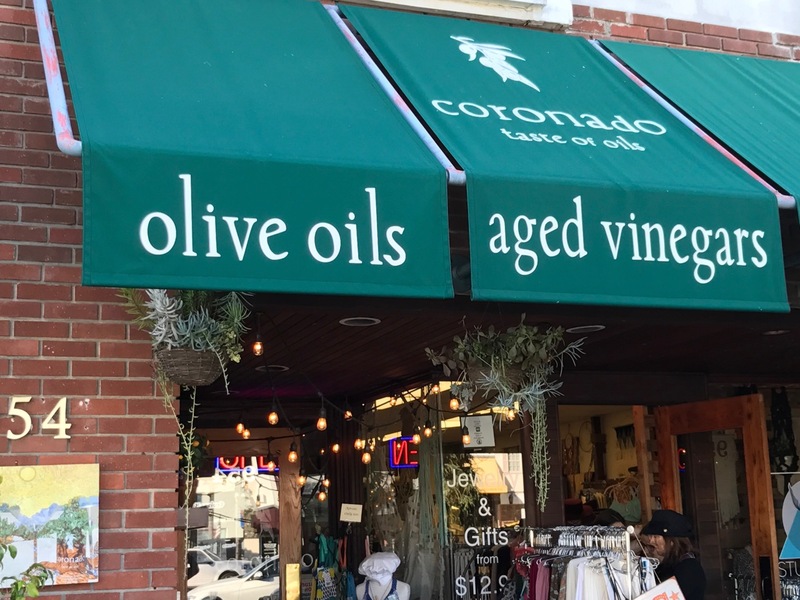 I first became aware of all of this when I wondered into a store called Coronado Taste of Oils in Coronado, California just outside of San Diego. 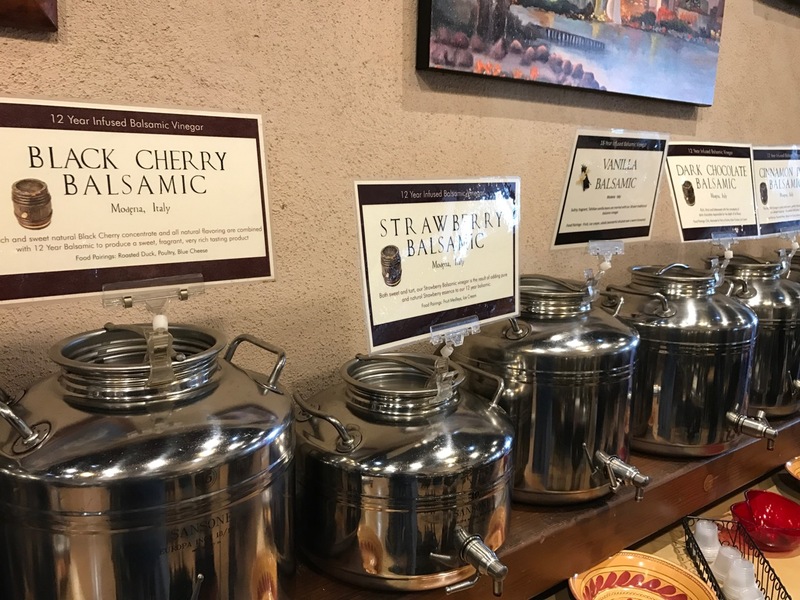 It features flavor infused olive oils and balsamic vinegars as well as the very knowledgeable owner, Roberta Korte, and her staff. The products are in small steel urns and can be tasted. If you want to buy one a bottle can be filled, sealed, and off you go. The oils tasted different than olive oils I am used to, and not just because of the flavors added to them. They were fresh, very fresh, and I found out that makes all the difference. My education began with an interview with Roberta. She explained the health benefits of the oils but emphasized that to get those benefits you should consume the oils six to eight months from the date the olives were picked and crushed, and that needs to be the same day. After that, both the taste and the benefits go off a cliff. She recommends to her customers that they not buy more oil than they can use in six months. I was there in the Fall. Olives from the Southern Hemisphere are crushed in June and July, so she was selling mostly oils from that hemisphere then (the same olives that are found around the Mediterranean have been planted and are available from Southern Hemisphere countries). In the Northern Hemisphere olives are crushed in November and December so you want to buy them early in the year. The supplier of the products is Veronica Foods Company located in Oakland, California. I spoke to Veronica Bradley who explained that freshness trumps everything when it comes to olive oil and the lengths they go to in order to supply the freshest oil possible. They have identified the best producers in both hemispheres and work directly with them according to requirements that they give them. These include harvesting the olives when they are green and insuring that they are milled within four hours of when they are picked. Green olives are more difficult to pick and give less yield than more ripened olives, so supermarket oils have an incentive to pick later. But green olives are fresher. The University of California at Davis, in addition to being America’s leading educational institution for winemaking, also studies olives. In a famous study published in 2010 they found that 69% of the oils sold in supermarkets and big box stores as extra virgin failed international and USDA standards, both sensory and chemical. In other words, they are not extra virgin olive oils. Some were diluted with lesser oils and even other substances. The study can be found at http://oliveoil.ucdavis.edu/research/files/report041211finalreduced.pdf. In addition, by the time many mass-produced oils reach the stores they can be pretty much near the end of their shelf life, no matter what the “packed date” or the “best by” date on the bottle says. The crush date, which you never see, is what matters. But as a cook and a foodie, the most important thing to me is that the better, fresher oils just taste amazing. With the addition of infused flavorings like Tuscan Herb, Meyer Lemon, Mushroom and Sage, etc, the cooking possibilities are endless. Even more interesting from a cooking perspective are the balsamic vinegars. 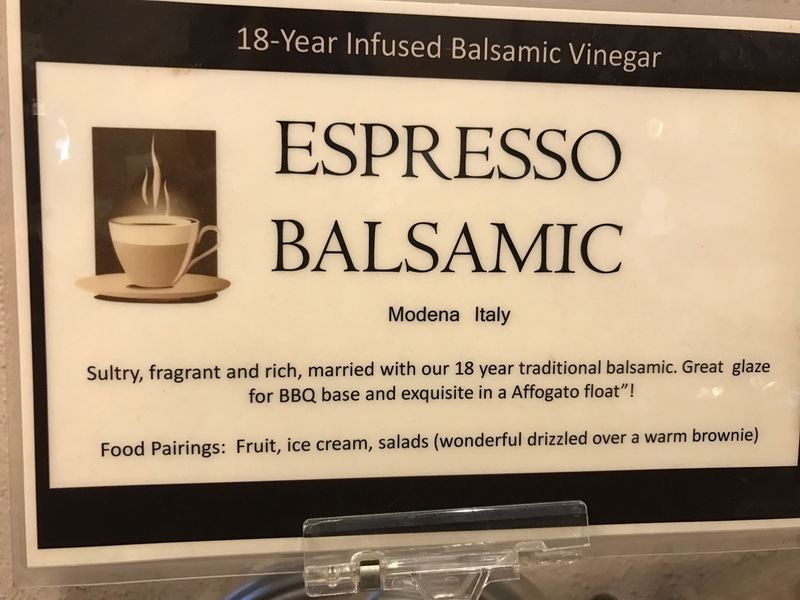 Balsamic vinegar is produced from the juice of white grapes which are boiled down to 30% of their original volume, then fermented slowly and stored for years in wooden casks. Balsamics have a rich, sweet flavor with no sharp taste. They can bring new character to food, awakening flavors and adding depth, a sort of smoky, earthy character, to all kinds of foods. Veronica Foods is also raising the bar on this product, using no coloring and no pasteurization, which kills the probiotics. This has gone way beyond salad dressings. They can be used in marinades, sauces, glazes, desserts, even cocktails. To get a quick idea of the potential dip a piece of parmesan cheese into an 18- year-old balsamic. Infusing olive oils with other flavors has been a thing for quite a while. Many of us have used garlic oil or truffle oil for years. Infusing balsamic vinegars has only been done for about a dozen years. It is a great idea and is like giving a cook his or her own toy store to play in. It was first done in the U.S .but is now migrating back to Italy. We got started with Cinnamon Pear Balsamic, quickly moved to Espresso Balsamic (which is great over ice cream), and are fooling around with everything we can get our hands on. Tasting these vinegars in the store makes you want to bring them home. Many people gave them as gifts and Roberta started getting calls from people saying that they loved tasting the vinegars, but what could they do with them besides making an interesting salad? This led her to start cooking classes, which have become sellouts. Each month an oil and a vinegar are featured in the store and used in recipes in the cooking class. Two recipes from recent cooking classes are below. There are more recipes on the store website (www.tasteofoils.com) and elsewhere on the web. Veronica Foods sells a cookbook called As Old as Time. If you can find a store like this near you, give it a try. It’s always best to sample the various products yourself. But if you don’t have one available, Coronado Taste of Oils does mail order. Happy tasting. Method: Mix the ingredients for the breading in a medium-sized bowl, set aside until ready to use. Preheat oven to 425 degrees. Place a piece of parchment paper onto a baking sheet. Brush a little Persian Lime oil onto the paper. Sprinkle the fish with salt and pepper. Bake for five minutes. Remove from oven and brush on the coconut cream. Sprinkle a generous amount of the crumb mixture evenly onto the filets and press onto the fish to adhere. Return to oven and bake until golden brown and cooked through, approximately seven minutes. Remove from oven and allow to stand a few minutes before serving, which keeps the topping from crumbling. Method: In a food processor, add the shallots, parsley and mushrooms. Pulse until finely chopped. Add the oil, vinegar, salt and pepper and pulse a few times to combine. Add the contents to a large bowl, gently mix in ground turkey. Form into 4 patties, making a slight indentation in the middle. Allow meat to rest in the refrigerator for 5-10 minutes to allow the flavors to combine. To caramelize shallots: In a large wide saucepan, add the oil. When oil is hot, add the sliced shallots and stir to coat. Turn head down to low and stir every 5 - 10 minutes until shallots are a golden-brown color, approximately 45 minutes. To cook patty: Preheat grill to 400 degrees. Cook on each side about four minutes. Move to a platter to rest while preparing buns. To Serve: Place a layer of avocado onto the bottom of each bum and place patty on top of that. Add cheese (unless previously done on grill) and top with caramelized shallots. For the Potato Salad: Cut the potatoes into bite sized pieces. Drizzle with Smoked Oil and roast in a 400-degree oven until done, about 30 minutes depending on your definition of “bite-sized”. Allow to cool to almost room temperature. Meanwhile mix up the dressing. In a shaker add the oil, vinegar and mustard and shake well. Pour over still slightly warm potatoes and mix well. In a small bowl, add the celery and shallots and mix in your cream. Pour over potatoes and fold in. Refrigerate for at least one hour before serving.